The lens of an eye is normally clear. 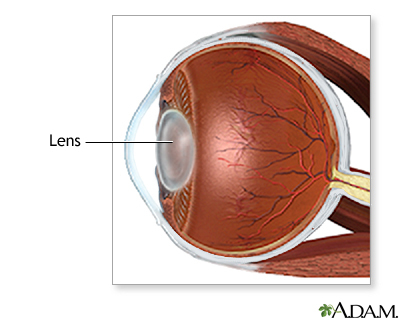 A cataract is when the lens becomes cloudy as you get older. Updated by: Franklin W. Lusby, MD, ophthalmologist, Lusby Vision Institute, La Jolla, CA. Also reviewed by David Zieve, MD, MHA, Medical Director, Brenda Conaway, Editorial Director, and the A.D.A.M. Editorial team. Editorial update 12/28/2017.